Halloween weekend is here, which means there will be festive decorations, little kids going door-to-door, and endless airings of John Carpenter’s classic film on cable. More importantly, for those of us who have trouble deciding whether to eat that leftover pizza or guzzle the dregs of that still-open bottle of bourbon for breakfast on weekdays, there will also be alcohol. So, so much alcohol. And although The A.V. Club officially endorses the “drink responsibly” policy, we’re also in the middle of a brutal game of vodka pong right now, so we’ve dug into the Halloween candy stash a little early. But wait—how do we know which bottle of wine to break out and accompany our candy fiesta? Thankfully, the sensible folks at Vivino have come up with an infographic that answers this question for us. Their “Halloween Survival Guide For Adults” chart tells you exactly which wines pair best with the assorted chocolates, candies, and sweet tooth accoutrements you’ll be consuming for the next 72 hours. (Let’s pretend this candy gorging will end on Monday, because we’re all polite.) Plus, this makes it much easier when you drunkenly stumble into the liquor store later tonight. 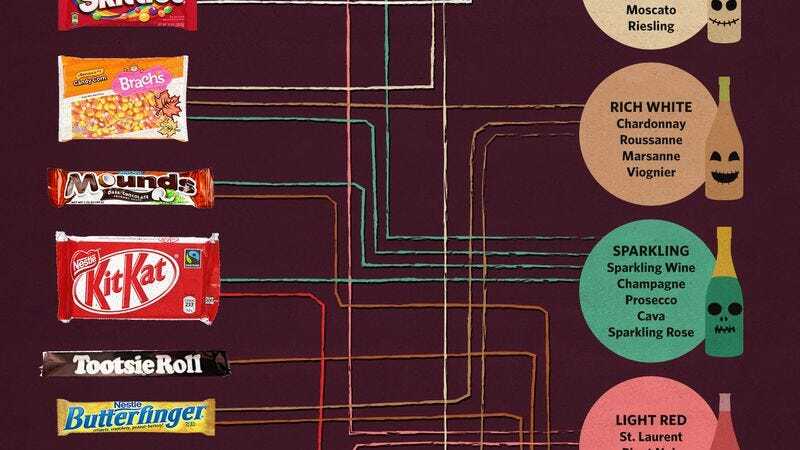 You can just point to the candy sticking out from between your lips, and indicate the relevant pairing on the chart. Everybody wins.